This is my very first bake which doesn't include any butter or oil. Though I like to bake lots of cakes and pastries ,I am quite hesitate to use big amount of butter as their calories content are pretty high. I know it's hard to avoid as long as baking is concerned. Sometimes I feel very sinful to eat the cake which contains generous amount of cheese, Chocolate and butter.But I have to admit that they are hard to resist lol. 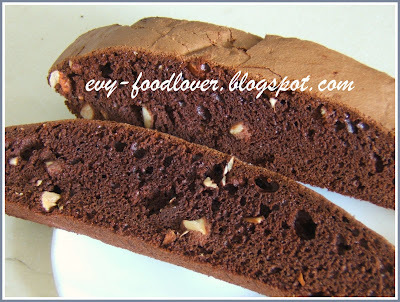 From health conscious point of view, we shouldn't consume cake too often and should replace with more veggie..(I have full of theories, but, as you all know , it's hard to follow :D :D) Anyway, I love to bake and I will still do baking by using healthier alternatives. 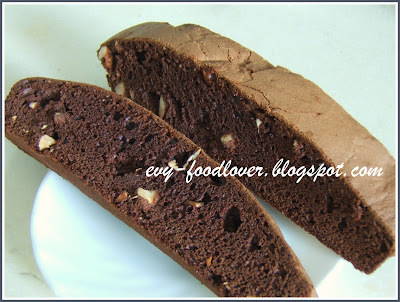 The Chocolate Almond Biscotti recipe is adapted from joy of baking . Here is my own version. Stir in number (1) , (2) and Almond into egg mixture. Shape it into dough in the baking tray (Mine was too soft to be shaped ) and bake for about 35 mins in 180 degree preheated oven. Cool it on wire rack for 10mins. Cut them into 3/4inch thicked slice and bake again in 160 degree preheated oven for another 15 to 20mins. Cool it on wire rack again and ready to serve.Enjoy! Super great photo. I'll bet they were delicious.